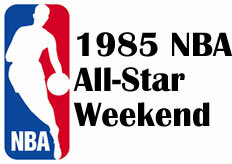 Before a record crowd of 43,146 in Indianapolis, 7-foot-4 Houston forward Ralph Sampson scored a game-high 24 points and grabbed 10 rebounds to help the West break a five-game losing streak with a 140-129 victory. The crowd at the Hoosier Dome was the largest ever to attend an NBA game up to that point, topping the mark of 41,163 set at an Astrodome doubleheader in February 1969. Sampson's MVP performance, coupled with that of the Lakers' Magic Johnson, who had 21 points and 15 assists, enabled the West to pull away late in the game. Detroit's Isiah Thomas and Boston's Larry Bird led the East with 22 and 21 points, respectively.